Click on images on the right to enlarge them. In fact, this year a lot of exhibitors and buyers postponed their travel by one day – me included – to see how it fared. I was supposed to be a Golden Image Judge and missed doing it. As it turned out New Orleans was not hit hard and no one even noticed. 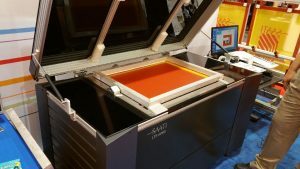 The show was the typical huge venue of wide format printing with a sprinkling of garment screen printing and direct-to-garment here and there. 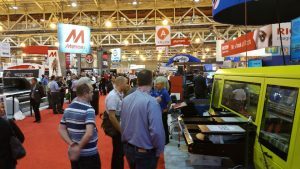 This year they had over 19,000 attendees and 597 exhibitors. Due to space limitations there was no “Garment Zone” where the entire process was demonstrated in a “no sell” area of the floor. And, there were no free “show floor” seminars. These areas have become a staple of the show in years past and I am sorry to see them discontinued. That was too bad and I think it might show the direction the Association is taking. It has often been a hard sell to tell garment decorators why to go to SGIA over the more popular ISS Shows and/or even FESPA in Europe and my reply was always there were free seminars and lots of demos. In fact, for a lot of us “old timers” the announcement that in 2019 the show was going to be in Dallas and the name was being changed to Print United – a for profit show co-owned by SGIA and NAPCO Media – publisher of print magazines – is very bittersweet. No more SGIA as we know it! A tear will be shed by many of us who have spent our careers going to SGIA. There is a quick article in Printing Impressions Magazine (for paper and package printing) that details the changes. 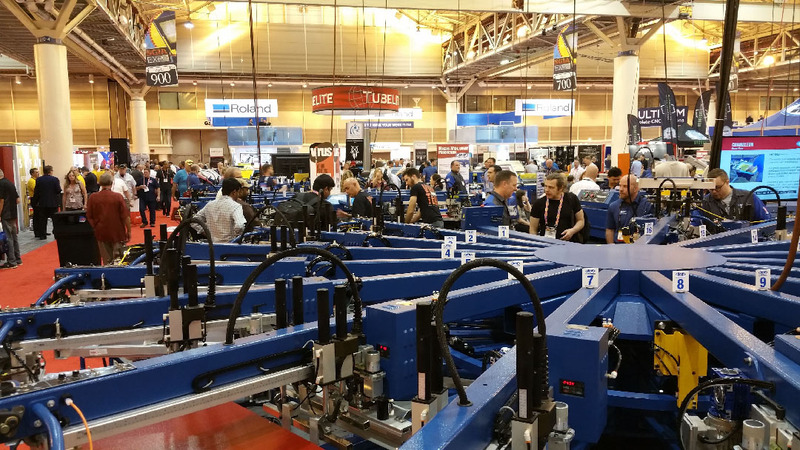 Even though the show was mainly wide-format printing and related services – in fairness to the garment community M&R had a huge booth and was out in force – as always – with the latest in screen printing equipment and their new Digital Squeegee. In fact they had two large displays running digital images. One of the displays bragged over 400 shirts per hour. They screen print a plastisol base, flash cure it and then print digitally on top. It is a thing of beauty – and very expensive. Here is an M&R promotional video. Do a YouTube search of M&R Digital Squeegee to see more videos. Here is a video I shot of the slower (200 prints per hour!) Victory One hybrid system. Richard Greaves and I did a number of T-Shirt Report interviews and videos and you can see them all in one place on the T-Biz Facebook page at www.Facebook.com/tbiznetwork. 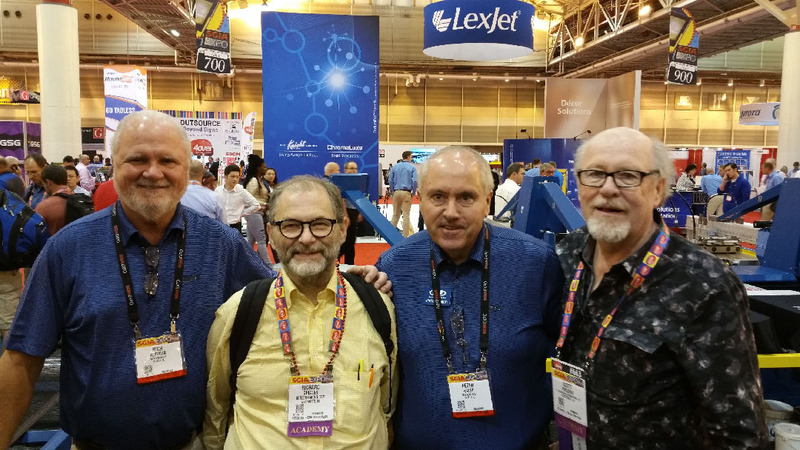 Our friends from Virus Inks of Italy were printing and showing their ink in the M&R booth and we did a Facebook LIVE interview with Beppe Quaglia. 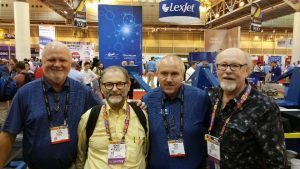 We did a number of interviews during the show including one with Ted Stahl of Stahls who was introducing a great new heat applied graphic for polyester and performance wear with zero bleeding and a very soft hand. The other large auto guys were there including MHM (with Hirsch Solutions) and sROC with Ryonet – but it seemed that they all had a smaller footprint. There were highlights but frankly from my point of view (garments) the M&R digital machines were it. Brother was showing their new GTX DTG printer and of course Epson had a huge booth and there was a LOT of DTG. Saati Computer To Screen Laser System (no film or ink image) protoype. What was absent were the many ink and emulsion manufacturers who now were exhibiting with their dealers – or not at all. There seemed to be a void. What was very HOT and was being shown as a prototype was a laser exposure unit by Saati that would image a coated screen in under two minutes with no film and no inkjet ink on the emulsion. You simply lay a coated screen on it and give it a graphic image (already separated) and watch it go. OK, at a suggested price of $88,000 and no delivery date it was at least new and to be honest – something to watch down the road. There were a number of social events and for many of us this is where the networking happens. When the show closed the first day there was a huge free mixer in the Golden Image display area. As is typical with New Orleans, they had a small jazz band open the event. The Golden Images entries were way down and the days of wall to wall black shirts is a thing of the past. 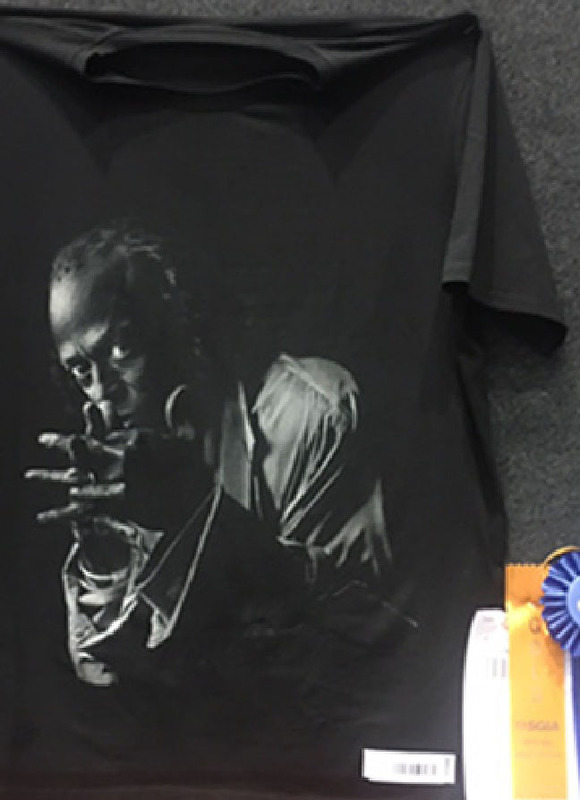 Our good friend, Artem Nadirashvili of Midi Print in Moscow, Russia won Best of Show Garments for a great Miles Davis print on a black shirt. Best in Show for Garments from Midi Print. The Garment Decorators Committee had a two hour lunch with speakers and they announced a new event called ThreadX18.com to be held in Palm Springs, California USA February 24 – 28. Here is a short video shot by Greg Kitson. 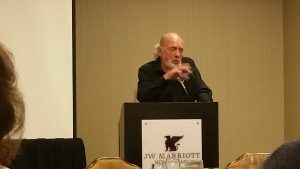 Michel Caza at Academy dinner. I am a member of the Academy of Screen and Digital Printing Technology and we have our yearly dinner. This year our good friend and Academy member, Michel Caza of France talked about a new book he is coming out with. 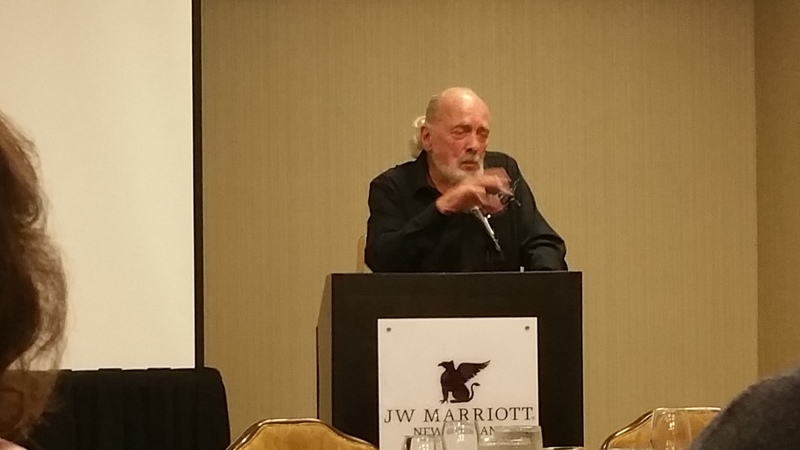 The Academy also awards the Swormstedt Award for excellence in writing and this year Mark Coudray was the recipient. 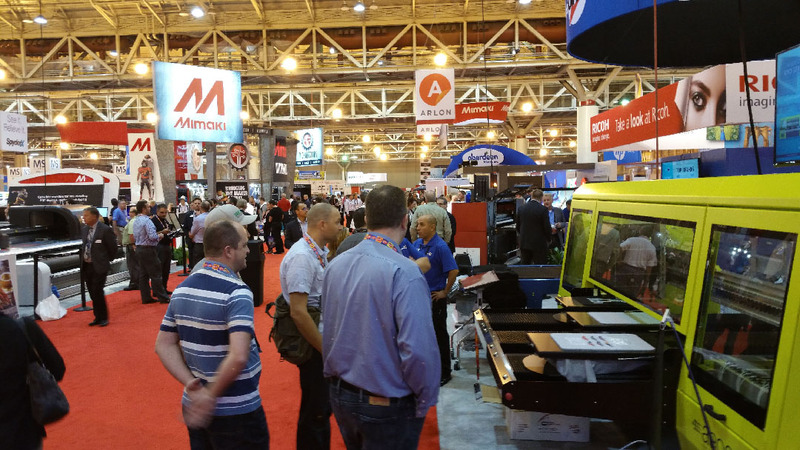 Next year the show goes back to Vegas – for one last “SGIA Expo”. It is hard to know how the newer show will fare for garment decorators. The current show seems to have all of the DTG manufacturers out in force but the lack of the other suppliers and even blank garment vendors continues to make SGIA a “hardware” show – which is not a bad thing. If you want to see what is new and trendy and the future – you go to SGIA. 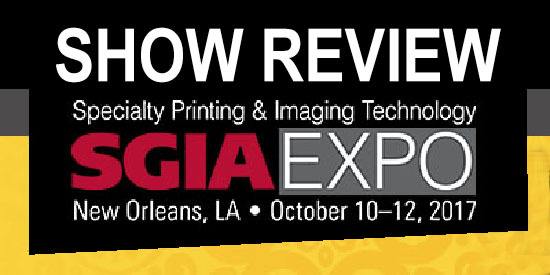 SGIA did a good job of putting up a Show Recap of their own and you can read/view it HERE. Previous articleFresener-Greaves T-Shirt Report is Back! Check out our latest show.